Lozeau Lodge offers over-night and extended-stay accomodations in our beautiful log cabins, and our Event Pavilion and grounds are available for group events, such as Weddings, Retreats, Business Meetings. Call us TODAY to schedule your choice of lodging or book your event date(s). Call (406) 822-4561 for reservations. Or EMAIL us: lozeaulodge (at) montana.com. Ask about our multiple-day discounts. at one of our log cabins and enjoy the views from your own private porch...perfect for wedding parties and business events. Cancellations will receive a 50% refund if cancelled before 30 days from arrival date. If cancelled less than 30 days from arrival date, no refund unless rebooked for reserved dates. Check in time is 3:00 P.M. or earlier if available. Check out time is 11:00 A.M. on morning of departure. 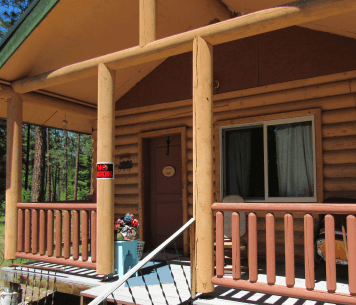 NO SMOKING, No Tabacco, No Drugs: Lodge, cabins, porches and property are all NON-SMOKING. If request is ignored, $100 restoration fee is charged to your credit card. BYOB Alcohol. PETS: Kennel and fenced pet yard are available. Well-behaved pets less than 40 lbs allowed only in Elk Cabin with $50 pet fee. All other cabins are pet free. CALL US ANYTIME (406) 822-4561 | Fax: (888) 610-2726. Our reasonable rates accommodate even the most frugal vacation plans. Summer vacation packages to suit almost every budget. 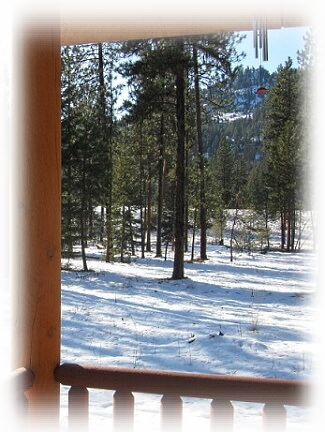 The very best in Montana cabin rentals is an easy distance from Missoula Montana and from airports in Spokane Washington and Couer d'Alene Idaho. Your VACATION PACKAGE will let us pamper you while you enjoy a most private, scenic, pristine, and picturesque area. You will come away renewed, re-invigorated, and revitalized from a respite to remember, here at LOZEAU LODGE MONTANA vacation cabins and wedding event venue -- the best in motel, hotel and wedding event accomodations in Western Montana. CALL US ANYTIME (406) 822-4561 | Fax: (888) 610-2726. Our reasonable rates accommodate even the most frugal event or vacation plans. Let us pamper you while you enjoy a most private, scenic, pristine, and picturesque area. You will be renewed, re-invigorated, and revitalized from a respite to remember, here at LOZEAU LODGE MONTANA vacation cabins and wedding event venue -- the best in motel, hotel and wedding event accomodations in Western Montana. MORE THINGS TO DO in beautiful western Montana. LOZEAU (Lozo) LODGE rents beautiful Montana vacation log cabins with all the amenities of first-class lodging set in a modern rustic style -- and now we have a beautiful outdoor Event Pavilion available, too. Lozeau Lodge is off the beaten path and yet located conveniently to Interstate 90. No need to drive miles of twisting, winding, dirt roads to reach the best hotel-motel travel accommodations and vacation deals in cabin rentals or wedding venues in Western Montana. LOZEAU (Lozo) LODGE rents beautiful Montana vacation log cabins with all the amenities of first-class lodging set in a modern rustic style. We're off the beaten path and yet located conveniently to Interstate 90. No need to drive miles of twisting, winding, dirt roads to reach the best hotel-motel travel accommodations and vacation deals in cabin rentals for Western Montana. Modern Rustic Cabins For Rent and an Outdoor Montana Wedding Venue near Missoula Montana, Lozeau Lodge is an excellent homebase for all types of western Montana adventure, including geocaching and tourist sightseeing. With 12 acres of our own, Lozeau Lodge Inn is at the gateway to popular destinations such as America’s gem: the World Renowned Glacier National Park. And we're an easy drive from Flathead Lake, the largest natural lake in North America.